Love swimming and water sports? or even just hanging out by the pool while listening to music. Many of you already have Micro SD on hand, so we decided to make the Tayogo Waterproof Mp3 Player with card slot, so you can listen to your music anywhere even under water. Easy to Install the Micro SD. Screw out the headphone and open the case. 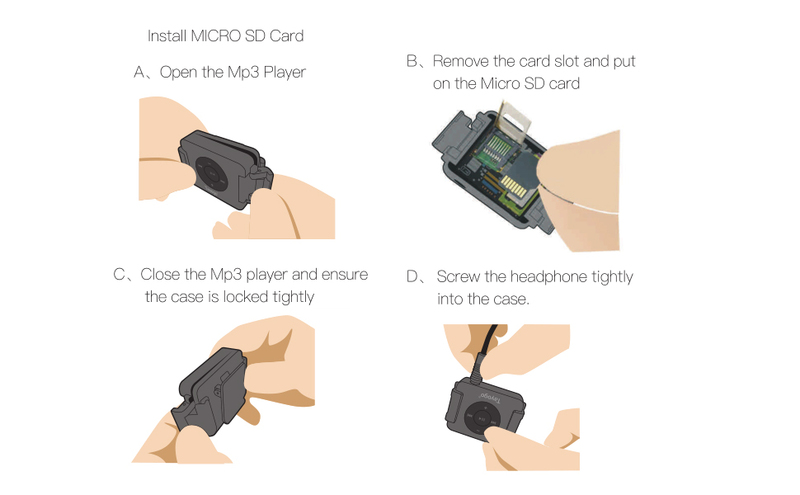 Remove the card slot and put on micro sd card. Screw the headphone or extending cable into the case tightly. Together with Tayogo Professional Waterproof headphones, you can use your mp3 player same way as on lands. The Micro SD not included. You need to use your present card or buy seperately. The compact Mp3 Player comes with our proprietary earbuds that keep the music in and the water out! It's light and clips easily on to a swimming goggle when swimming laps, bikini strap(for women), and comes with a headphone line extender or arm band so you can clip the player how you prefer. Swim under water and listen to music so you can energize your workouts, go running with it and don't worry about getting sweat on your Mp3 Player. IPX68 Waterproof Mp3 Player with waterproof headphones.